Beauty Costs > How Much Does Tailoring Cost? How Much Does Tailoring Cost? Tailoring is the process when clothing, such as suits, pants or a jacket, is made to be a different size or length to fit your body like a glove. Since most clothing on the shelves generally does not fit like that glove, a tailor is going to make this happen — for a price of course. The cost of tailoring will depend on the type of the clothing, what is going to be done, the number of clothes that need to be tailored and the tailor/company. 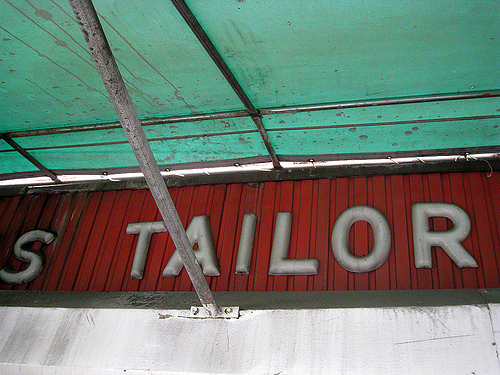 “S TAILOR” (CC BY 2.0) by H.L.I.T. On average, the general rule of thumb is to take the original price of the clothing and expect to pay anywhere from 5% to 20% of the original cost for tailoring. For example, a suit purchased for $300 would more than likely cost anywhere from $15 to $60 have professionally tailored. On average, tailoring is going to cost in the range of $5 to $8o. This is going to greatly vary depending on the geographical location of the customer. Refer to our table below to see what you may pay. Some retail stores may have a set fee, no matter what the item is. For example, the ZOOTS Brookline Village branch in Boston, Massachusetts, will charge $22 for two items. Clothing such as dress shirts is going to be less expensive than a suit. On average, a casual shirt can cost anywhere from $10 to $20 to have altered/tailored. These tend to be the easiest article of clothing to tailor. Common items such as pants can cost anywhere from $10 to $50. See: “How much do pant alterations cost?” This cost will depend on how complicated the pants are and the material it’s made of. If the leg had to be opened, for example, the costs could about $40, but if the bottom has to be hemmed, it could be closer to $20. Suit jackets can cost anywhere from $25 to more than $120; again, depending on the complexity and what needs to be done. If the sleeves on the jacket has to be shortened, the costs can be between $25 to $35; however, if the sleeves have to be taken off the jacket and reattached, the costs could get closer to $100. Shortening the jacket, another common tailoring job, can cost about $30 to $40. One member on Reddit.com said the general consensus is a shirt should cost around $10 to $20, while a coat should be about $35 to $40. This, of course, would depend on the alteration that needs to be done. A leather jacket tailoring can cost anywhere from $40 to $100 to shorten the sleeves, depending on the setup. Shortening can cost $40, while shortening zippered sleeves could cost closer to $100. Travel tailors are available, and if you want delivery, as well as pickup, tailors are going to charge a delivery and mileage surcharge fee. Expedited tailoring may cost more, depending on the tailor. Most are able to complete the job within 48 to 72 hours. Tipping your tailor is highly recommended. As per RealMenRealStyle.com, it’s best to tip them a few dollars for their time. Adding, moving or removing a zipper could cost $15 to $30. Hemming leather could cost 20 to 40 percent more. For a simple job, consider talking with a local dry cleaner. Many tailors offer discounts to loyal customers. Once you find a good tailor, stick with the same one. If you have more than one suit to tailor, consider bringing in as many as possible at once. Most are going to be more than happy to provide a bulk discount. Bring the clothing to the store you purchased it from. Oftentimes, these stores will have tailors on site and will be able to offer a discount if you purchased it there.